Dave Bell contributoed to this report. James Zenyuh, 41, has broken the USMS 40-44 American Record in the 50-yard butterfly…. 21-time Cal All-American Catherine Breed won 2 races at the PacMasters Championships last week. Maximizing your potential in the pool is hard enough without having to deal with self-inflicted negativity. Here are 6 toxic thoughts every swimmer should drop. 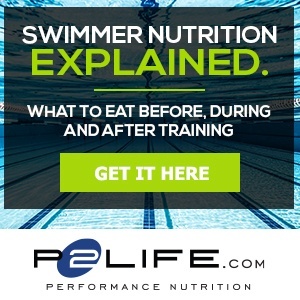 Some athletes don’t consider nutrition as a part of training, but it is one of the most important building blocks in your swim training and can greatly impact your performance. What you eat right before the race is just as important, so we’ve put together some meal ideas that will keep you going throughout the day. You feel ready, but before you set off, there are three common mistakes swimmers make on, and just before, race day. Don’t let these dietary blunders jeopardize your performance on the big day. I was at our team’s Masters meet this weekend and I noticed how the energy was different than at an age group meet. In addition to fewer swimmers and spectators, everyone looked relaxed. Realizing the growing popularity and potential of college clubs, US Master Swimming announced that it would step in and provide the infrastructure and organization currently missing in collegiate club swimming. Jeff Farrell, Olympic Gold Medalist and many-time WR holder, was trapped in his house with his family during a mudslide. A gofundme page has been set up to help the family restore their house. Susan Helmrich beat cancer 3 times. What has she to fear from 5 degree temperatures and a little bit of snow?